There’s only one thing better than seeing the newlywed couple cut into their delicious looking cake. A stunning candy buffet! As we embark upon what is truly the season of love, we’re most looking forward to an assortment of sweet treats. 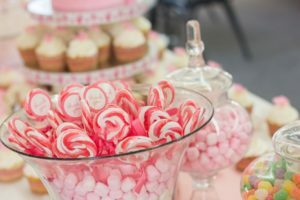 Sure, wedding cake is fun, but it’s the candy we’ve truly got our eyes on, especially when it’s in the form of a buffet! 1. Choose a color palette. The easiest way to approach this step is simply to stick to the color scheme or theme of your wedding party. Keep candy options within this range to create cohesion, and use matching décor. It’s easy to find (or create!) fun display decorations in your chosen color scheme, such as a centerpiece, labels, and little table accents. 2. Sparkling equipment. A beautiful candy buffet requires some top-notch supplies. Think jars, glasses, bowls, spoons, and tongs. If you want a display that is a bit more sleek and sophisticated, opt for containers in simple styles, keeping variation to two or three designs. If you’re looking for a whimsical touch, search for a wide variety of jars and bowls in different sizes and designs. 3. Choose the candy. Here’s where the fun really begins! Shop for a selection of candy buffet candy in your chosen color scheme. Think bulk unwrapped candy choices such as colorful chocolate balls, single-colored jelly beans, bright gummies, and rock candy. You can also add a few jars of individually wrapped candy, such as foil wrapped chocolates or mini candy bars, adding a touch of nostalgic charm. 4. Fun accents. While we’re all about the candy, candy buffets can include a little non-edible fun. Add matching décor to your candy table to make it truly one-of-a-kind. Consider adding a jar of sparklers or mini bags of confetti for your guests to use when they send you off! If you’ve got non-candy favors, include them on the table as well. Hot dogs, pretzels, and baseball go hand-in-hand, don’t you think? After all, there’s nothing quite like heading to the concession stand during a break in the game to purchasing a mouthwatering hot dog, salty roasted sunflower seeds, or an ice cold snow cone. Not only do concession stand treats satisfy your hunger, but there’s just something so classic about munching on these very tasty foods during a perfect summer game! Days spent at the ballpark sure do work up an appetite! Foods like hot dogs and soft pretzels immediately make us think of the summertime, bringing about the timelessness of eating delicious food from the stands of your local ball park. Nachos and fries are staples for sharing or, for snacking on all on your own! Everybody needs a little sweet or sour now and then! Gummy candies, such as peach rings, Swedish Fish, and Sour Patch Kids hold well in the heat, providing sour and sweet notes that every patron is craving. Need something chewy? Big League Chew bubble gum is essential at the ballpark, sure to please both children and adults alike! When it comes to a sunny day spend in the stadium of your local ballpark, frozen treats are a necessity! Ice cream cones and cups, complete with a variety of toppings, are always a crown favorite. Snow cones, drizzled with fruity syrups, are a favorite of little baseball fans of all ages! When you’re vending these delicious snacks, the crowds are sure to come!